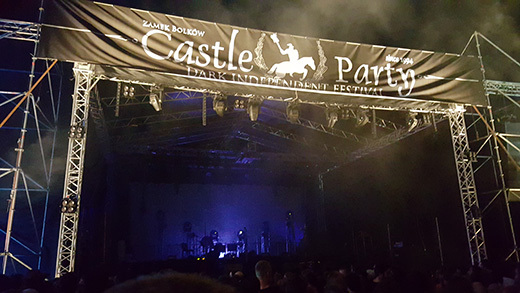 This year, the annual Castle Party in Bolkow, Poland, the 22nd annual edition of the event—announced itself be a “Dark, Independent” music festival. This Eastern-Central European gala, takes place in a small town in the region of Lower Silesia, an area adjacent to the Czech republic on the country’s south-western rim, previously German until the gerrymandering that followed the Second World War and now solidly Polish. Guests come from all over Poland. There are also Czechs, Germans, Russians, Ukrainians and even Brits, but we didn’t spot any other Americans. 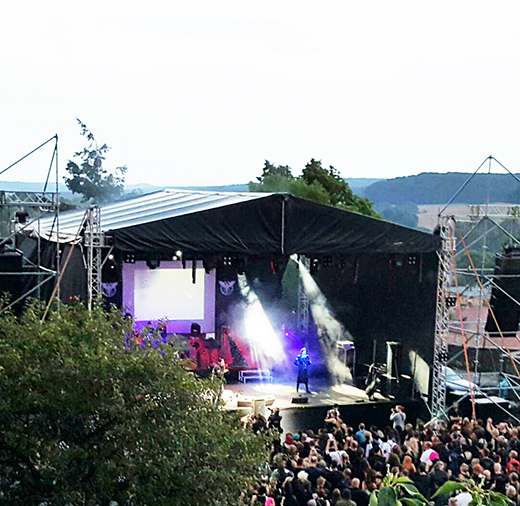 The ruins of a huge castle dating back to the 13th century sit atop a steep precipice and, along with a large, flat, gently sloping field where the audience crowds in front of the main stage, serves as the seat of the festival. The upper, outdoor levels of the castle house clothing and accessory vendors, plus food and drink stands. A few spectators climb up to the upper battlements where they can view the stage and the field from on high. 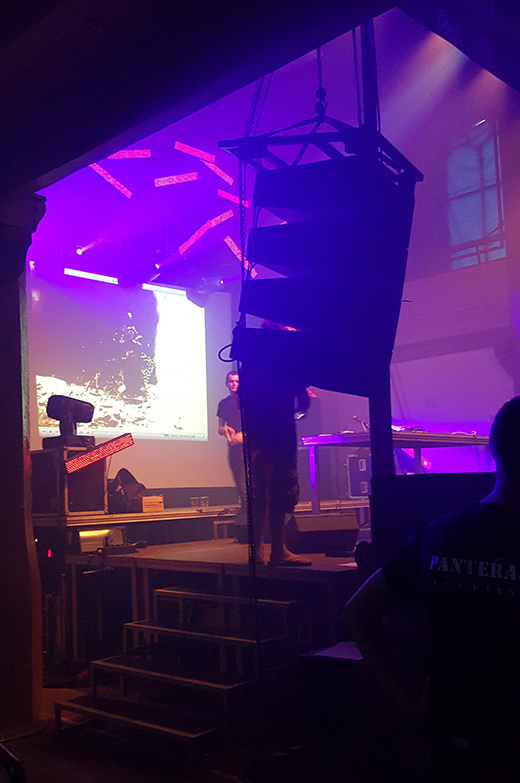 Down in the town itself, which is reached by descending a cobblestone-paved ramp and some city streets, there is a converted and no longer used former Evangelical church that serves as the other live music venue, hosting the second stage where each day features a different, specific theme — Gothic the first day, metal the second, industrial the third and, finally, electro on the last. It was here that the musical experience was most concentrated, with fewer distractions than up at the castle. Food and drink vendors served from tents and motor vans. Ample, sanitary portable toilet facilities were everywhere and well maintained. With six or seven musical acts each of four nights at the church, and with at least that many on the big outdoor stage at the castle, it is impossible to take it all in, let alone review and/or report on all. Instead what follows are some noteworthy highlights. Thus, the first night, Thursday, we heard a variety of mournful, minor-key melodies, mostly female vocalists, often accompanied by sexily clad stage performers, holding lit candelabras during their sets. 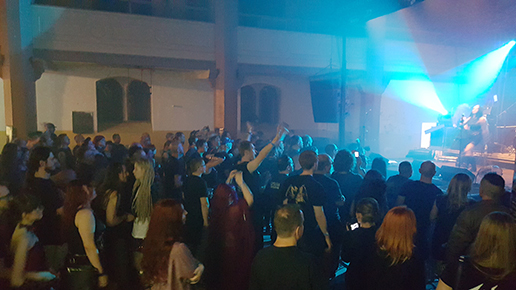 One band, titled 1984, totally out of place at a Gothic-themed show, rocked the church with old school style punk and rap-like repetitive mantras (in Polish) ranting about angst, ennui and disillusionment. Skeptical Minds, a tight, hard rock group sounded like The Birthday Massacre, with a female lead vocalist. Again and succeeded in pulling a mosh-pit out of the otherwise sedate crowd the first night. There are also a couple of clubs in town, namely the Sorento and the Hacienda where DJs spin darkwave, classic Goth and post-punk and where late night-into-morning dancing takes place. There’s also an encampment behind the Hacienda for travelers who choose outdoor lodgings during the festival. 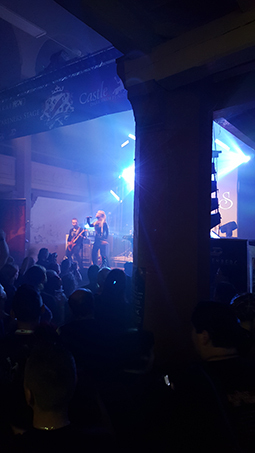 Friday at the church was “Metal Day.” We joined the devotees for a listen to Darzamat, a Polish dark metal band. 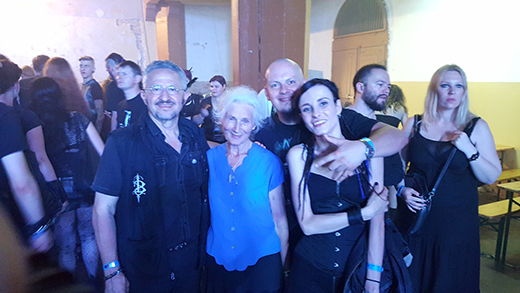 To our astonishment, we found tiny Helena, a petite and friendly octogenarian in a light blue dress standing deep in the head-banger crowd, rocking to the heavy sounds and occasionally peeking over the shoulders of the guys in front of her to catch a peek at the band. On Saturday we didn’t mind standing in a light drizzle up at the castle to catch the Norwegian ensemble Wardruna whose music is featured on the second season of TV series “Vikings.” Sounding somewhat like a primitive, Ice-Age version of Dead Can Dance or a somber version of Corvus Corax, Wardruna attempts to resurrect the medieval, runic sounds of ancient Scandinavia with ribcage-rattling, vibrating percussion and ominous, vocal duets. They were followed by crowd-pleasers Paradise Lost, a classic heavy metal/ Goth-rock U.K. group that seemed to be the main attraction for this international audience. Down at the church it was “Industrial Day,” and we stumbled upon one of the most extraordinary and memorable performances of the festival. Swedish project, Raison D’être projected grainy, sepia-toned video images of crumbling sacred architectural ruins while playing enigmatic, compelling industrial noise, sometimes but not consistently rhythmic, sometimes involving guitars and occasional chant. We found it to be the most artistic and emotionally moving experience of the festival! The last night featured The Frozen Autumn from Italy singing gorgeous slightly discordant melodies in British-accented English accompanied by heavy, synthetic, galloping rhythms. 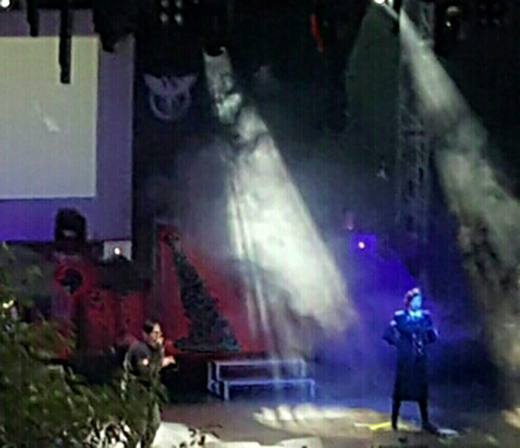 Then came headliners, Austrian pseudo-militaristic Nachtmahr, wearing fascistic uniforms and singing denunciations of war to electro-industrial accompaniment. The sudden outbreak of a thunderstorm cut their set short as everyone fled the threat of lightening strikes at this mountaintop venue. Castle Party Bolkow now enters its 23rd year and is, by all appearances, ever expanding. 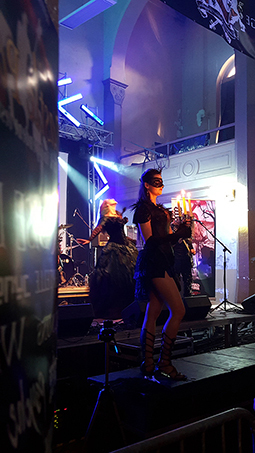 It is by no means a canonical Goth-rock event, but rather a gathering of folk from the Gothic life-style who enjoy a whole spectrum of “dark alternative” music, morbid preoccupations, macabre attire and radical, non-conformist personal style. 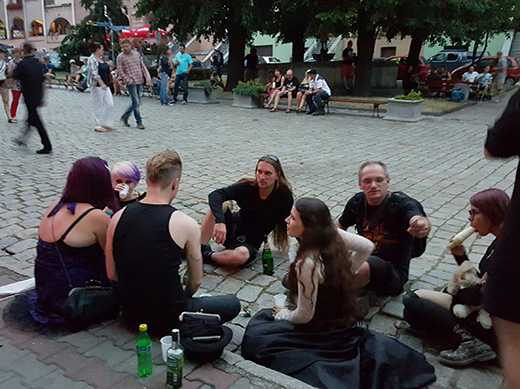 It affords members of that subculture an excellent opportunity to meet, socialize and make or renew friendships with like-minded individuals. It is certainly one of the wonders of the modern world to observe this ghoulish-attired crowd infiltrate and take over a happily compliant and very hospitable rural town for four eventful days. Once having attended these festivities, it is inconceivable that one wouldn’t want to make this a recurring, annual trip.